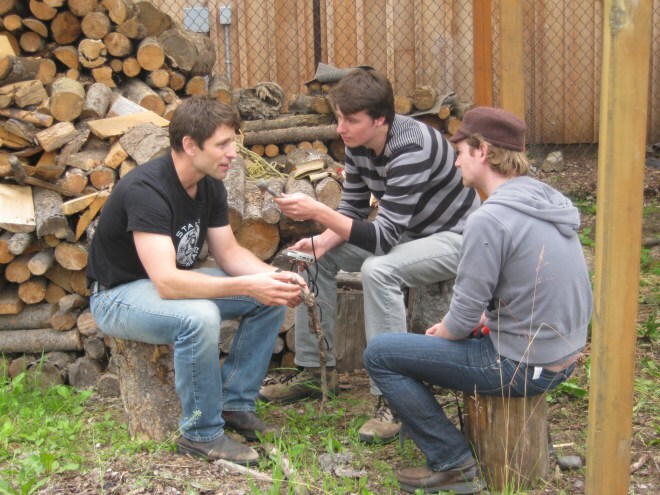 David Kaczan and Marcus Peterson (middle and right) were two of the Terra Informers who journeyed out to capture voices of locals along the Northern Gateway project route. 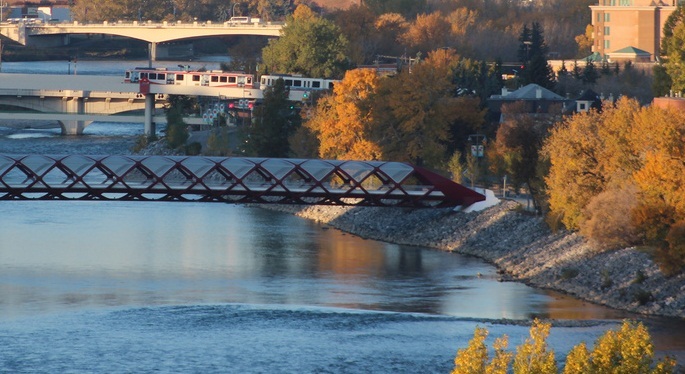 Every time I go to Calgary recently, people ask me what I think about the red skeletal swoops of the new Peace Bridge. I don’t have strong feelings about the bridge itself, but I was reminded of its pedestrian crossings this week when the Joint Review Panel decided to recommend building the Northern Gateway pipeline project. Two years ago, I remember debating the objectivity of the Joint Review Panel process assessing the proposal to chug Alberta’s bitumen out to Kitimat. In early 2012, Terra Informa released a two-part radio documentary called Rough Waters & Divide Valleys: Voices from the Northern Gateway Pipeline. We sent a team of independent radio journalists out from Edmonton in the summer of 2011, and they travelled the route of the proposed pipeline, having conversations with locals along the way. I remember being surprised to hear how widely opinions diverged, especially in towns like Prince George where some talked about fearing for their forests, and others spoke plainly about hoping the pipeline would bring jobs to town. What I also remember from discussions around that time is that many people in BC felt that the whole consultation process was rigged. Thousands of Canadians were fired up enough about the issue to apply to speak at the Joint Review Panel’s hearings. The Federal Government reacted by writing a new law to severely restrict how many people can have their say in future consultations. It’s easy to see how this led to two main reactions among opponents of the project when the panel released their final conclusion that the proposal’s benefits outweigh its risks: complete apathy, and anger. This is where I’m reminded of Calgary’s Peace Bridge. Say what you will about the aesthetics of the pedestrian crossing, or its cost, or how close it is to other bridges crossing the Bow River downtown (and Calgarians have said a lot about those things). What struck me when I first visited it is that when you cross over to its north side, you’re dropped off right onto Memorial Drive, with no obvious way to cross the four lanes of busy traffic to get to your destination. I watched for a while to see how other pedestrians reacted. Most people looked earnestly for a safe place to cross, or a button to press. Then they saw how far away those were, and did the logical thing: they jay-walked. At no small peril to their lives, I might add! It demonstrates a basic principle I heard outlined by a guest on CBC’s The House a while back: when people believe they have meaningful, fair choices, they’ll go along with one of them. When they feel like the choices are unfair, they’ll either act out or opt out. If you need to cross the street and the nearest crosswalk is unreasonably far away from your path, it’s understandable to act out and jog across the road. Not safe, but understandable. The Joint Review Panel’s work was supposed to be an objective evaluation of the Northern Gateway project, weighing out the jobs, royalties, impact on local First Nations, risks to salmon-bearing rivers, risks of tanker spills, and adding it all up into one sober conclusion. But the Federal Government has been screaming its support for this project for years, passed a law limiting public participation in similar reviews in the future, and asked the National Energy Board to work with the RCMP and Canadian Security Intelligence Service to spy on environmental groups and First Nations participating in the public hearings. Under these circumstances, what reasonable person opposed to the project would believe it was a fair process? As ForestEthics Advocacy’s Amanda Follett says, it seems like the Panel wasn’t even at the same hearings as everybody else. This is why you’re not likely to see many opponents shrugging their shoulders and saying, “Well, we did what we could.” BC First Nations, community activists, and environmental groups are gearing up for a fight if the Federal Government ends up approving the pipeline next year. When the game looks rigged, reasonable people will likely make the choice to act out or opt out. If this thesis is right though, it offers hope to those fighting for genuinely participatory decision-making. When we see that our choices are meaningful, we’re more likely to jump in and help make them. That is something worth fighting for.